Learning all about the neonatal intensive care unit (NICU) is often one of the first steps in parenting a preemie. The first time you visit your baby in the neonatal intensive care unit (NICU) might be overwhelming. The sights, sounds, and smells are all unfamiliar, and the doors are locked and guarded. It may even seem like the people inside are speaking a different language! Knowing a little bit about intensive care nurseries and the caregivers you’ll meet there can make the experience less intimidating, and allow you to focus on spending time with your baby. A NICU, sometimes called a special care nursery, cares for babies who are born early, who have problems during delivery, or who develop problems and require a higher level of care. Although all NICUs care for babies who need extra help, different NICUs offer different levels of care. Level I: Basic Newborn Care: Level 1 nurseries care for healthy, full-term babies. They are able to stabilize babies born near term to get them ready to transfer to facilities that offer special care. Level II: Specialty Newborn Care: Level II nurseries can care for babies born at greater than 32 weeks gestation or who are recovering from more serious conditions. Level IIA: These nurseries do not provide assisted ventilation. Level IIB: These nurseries can provide assisted ventilation for less than 24 hours, and can also provide continuous positive airway pressure (CPAP). Level III: Subspecialty Newborn Care: Level III NICUs care for the sickest babies and offer the greatest variety of support. Level IIIA: These nurseries care for babies born greater than 28 weeks. They offer mechanical ventilation and minor surgical procedures such as central line placement. Level IIIB: Level IIIB NICUs can offer different types of mechanical ventilation, have access to a wide range of pediatric specialists, can use imaging capabilities beyond x-ray, and may provide some surgeries requiring anesthesia. Level IIIC: The most acute care is provided in Level IIIC NICUs, sometimes called Level IV NICUs. These nurseries can provide advanced ventilation, including ECMO, and can provide advanced surgeries including “open-heart” surgeries to correct heart defects. Level IV (sometimes called Level IIIC): A Level IV NICU is the highest level of neonatal care. Although there is no official definition for a Level IV NICU, some states and hospital systems use this designation for NICUs that care for babies with the highest needs. Although there is no standard definition for different levels of NICU care, the American Academy of Pediatrics (AAP) policy on Levels of Neonatal Care is used in many parts of the United States. The AAP policy does not recognize a Level IV NICU. The highest level of NICU care recognized by the AAP is a Level IIIC NICU. While your baby is in the NICU, he will be cared for by a team of doctors, nurses, and other medical professionals. Neonatology: Neonatologists are pediatricians with additional training in the care of newborn babies. Neonatal nurse practitioners, or advanced practice nurses who specialize in the care of newborns and doctors in training to be pediatricians (residents) or neonatologists (fellows) may also help care for your baby under the supervision of an attending neonatologist. 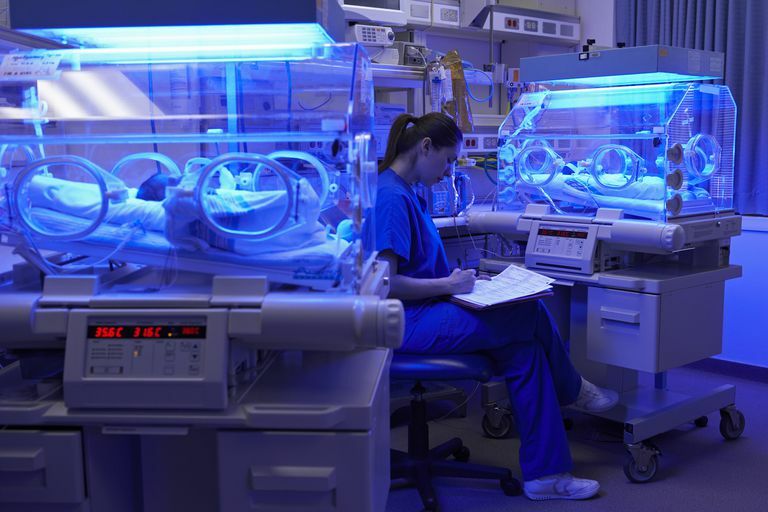 Nursing: Nurses provide most of the day-to-day assessment and care of babies in the NICU. They work closely with parents, neonatologists, and the rest of the NICU team to ensure the best treatment for the babies under their care. Respiratory therapy: Respiratory therapists perform many roles in the NICU. Their jobs include managing respiratory equipment, providing breathing treatments, drawing and analyzing blood gasses, and participating in transports and codes. Occupational and physical therapists: Premature babies require special positioning to promote healthy growth and development, may need special help to make sure they are learning to eat well and may benefit from infant massage. Occupational therapists (OTs) and physical therapists (PTs) provide these services. Ancillary staff: In addition to the health care workers listed above, many other helping hands may also care for your family while your baby is in the NICU. You may meet pharmacists who prepare medications for babies in the NICU, lactation consultants to help moms provide breast milk for their babies and help moms learn to breastfeed their premature infants, and chaplains and counselors to help parents cope with their baby’s illness. American Academy of Pediatrics. “Levels of Neonatal Care” Pediatrics 2004 114:1341-1347. Children’s Hospital West. “Our Caring NICU Staff.” 2008. March of Dimes. “Glossary: Common NICU Equipment.” October 2008. What Is a Level 3 NICU?